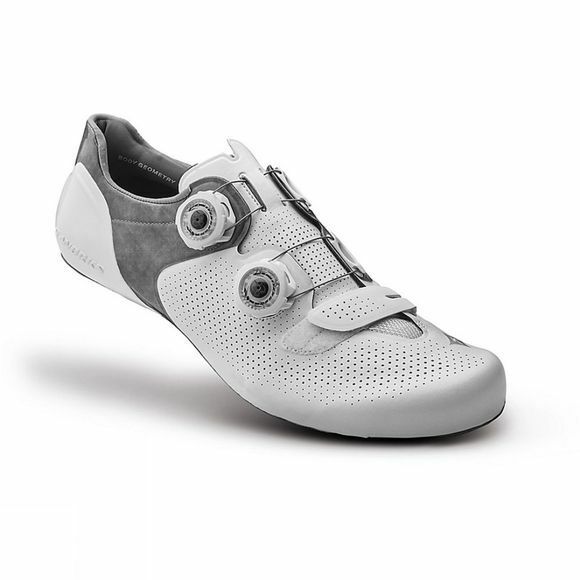 The S-Works 6 Women's cycle shoe from Specialized serves both explosive speed and superior comfort. The speed comes as a direct result of great fit and better connection, delivering more efficiency and power to the pedal. The PadLock heel, combined with revolutionary strong and lightweight materials in the upper, creates a snug fit contoured to women that's incredibly secure. A stiff and light FACT Powerline (patent pending) carbon plate to maximize power transfer: Stiffness Index 13.0. Two independent Boa® S2-Snap dials for easy adjustment.